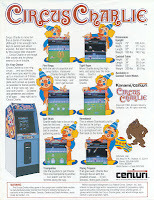 Circus Charlie was produced by Konami in Japan, which was distributed by Centuri locally. The game had it's own dedicated cabinet with a 2-way monroe joystick. The game features 6 stages that you are able to choose to earn points. The first stage Charlie is riding a lion jumping through rings of fire. The 2nd stage you walk a tight rope jumping over monkeys. The 3rd stage you hop on trampolines avoiding knives and flaming breath coming from the other circus performers as you make your way to the goal. On this stage if you hop too many times on the same trampoline you will burst through the top of the circus tent causing you to lose a life. Also if you beat this stage twice you will be placed on a similar trampoline board only this time dolphins will be the main obstacle. Stage 4 which is considered "hard" Charlie balances on a ball and hops to other balls to the goal. On stage 5 which is considered "harder" Charlie is riding on a horse where you can have the horse speed up or slow down jumping on spring boards or sometimes going under them to make it to the goal. On this stage when you hold back on the joystick while on the spring board you can accumulate multiple jumps on the same spring board yielding you a considerable amount of points. Stage 6 is considered "hardest". On stage 6 you swing from the trapeze, sometimes grabbing onto other clowns other times bouncing off of trampolines on the ground. Below is a picture of the stage select screen, another thing to note that is obviously done on purpose is that the game was made in 1983, distributed in 1984 at the time the Japanese game designers thought it would be cleaver to place the high score "19830" as the default when they were producing the game. They added a zero to the 1983 because they wanted it to be some what of a challenge to get the high score. The game will let you complete the same stage a few times before giving you a "no more" message forcing you to move on to a different challenge. 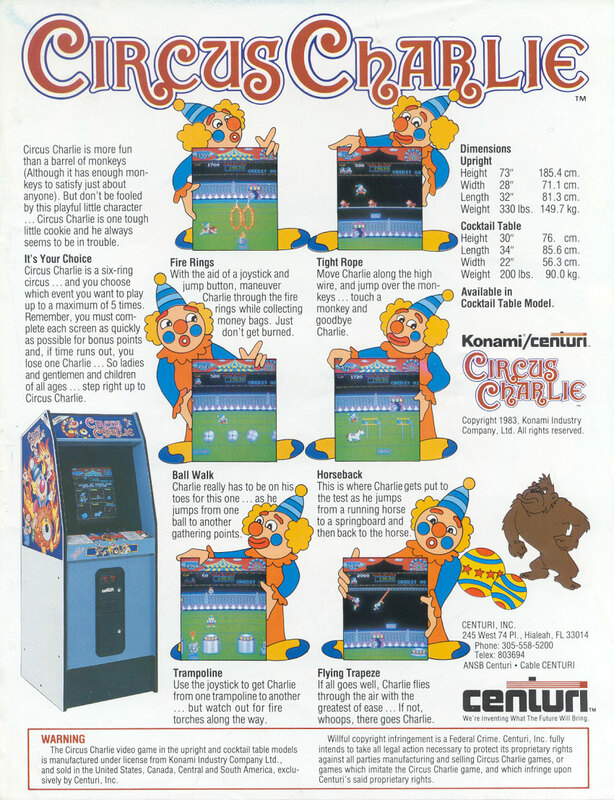 You have various secrets throughout Circus Charlie arcade game. On level one for instance if you jump backwards through a ring of fire on your lion and back through the same ring you will see another clown appear jump and grab him for an extra life. The stage I believe only allows you to earn 1 free player using this trick each time. The same level although considered easy if you keep repeating it will get progressively harder. Other places to jump backwards on level one is over the fire pits on the ground. Sometimes you will be rewarded with a coin that will pop up. If you collect all of the money bags on the level you will get a bonus at the end. The game allocates you a bonus timer you can take as long as you want on a stage but it's ideal to make it to the end the quicker the more points you will yield from the bonus timer up to 10,000 points. This game to me is the game that actually got me into this hobby all together. It's an obscure game that does have a cult following but those who know it seem to love it. When I was younger I went to sleep away camp and this was one of the games that was in the rec room that we were able to play. This was one of the games that I was actually good at on location and liked the fact that you can choose various stages to get more of a variety in game play. So I really wanted to play this game again it was roughly 20 years since I was able to. Down the road I discovered M.A.M.E. Those who don't know M.A.M.E. Stands for Multiple Arcade Machine Emulator. MAME allows you to simulate the older arcade games. The only problem was that I was playing circus charlie on a key board. After research I eventually ended up building a MAME cabinet which has thousands of games that it emulates. I discovered other titles in MAME such as Gun.smoke which landed me the world record, so I set out to buy / build a dedicated Gun.smoke cabinet. The thing is MAME is great in terms of testing a game out but it's not perfect and just not the same as having a dedicated cabinet. The sounds / video aren't perfect the controls aren't always the same and of course you don't have the artwork that sometimes makes the games. I tracked down a Circus Charlie at a local arcade auction and payed a very fair price for it, but was pretty beat up condition. However the game was working which is all I cared about, being that this game was the one that got me into this hobby I had to have it. Maybe one day down the road I'll find a better condition cabinet for this game but I do also have a spare PCB for Circus Charlie. In terms of any restoration I didn't really do much to the game being that the side art is not being reproduced. It never had any bezel art work which makes it slightly boring. The game does have stenciled stars on the front of the cabinet and sticks out like a soar thumb in an arcade lineup. The control panel overlay cleaned up very nicely after using a magic eraser. I put grease in the two-way monroe joystick which helped drastically. Replaced the buttons. Touched up the inside blue part along with the stars on the front of the cabinet. The cabinet also does have the original lettering "centuri" logo on the coin door. I also replaced the power supply with a brand new one. The game made it's way to several home consoles as well including Famicom, C64, MSX Playstation (Konami's greatest hits), and eventually made it's way full circle again back on the arcade in Konami's 80's AC Special (known as Konami's 80's Gallery in Japan) which actually used a hard drive. The arcade version had superior graphics to any of the home console ports.